This month, Escentual.com have had a third off ALL of their French Pharmacy brands. I meant to bring this up before, but kept forgetting, so I thought I’d do a quick run-through of my favourite and most-used French Pharmacy products. On the whole, brands found at the Pharmacie in France are affordable and simply packaged yet provide brilliant skincare for even the most specialist needs. Oily skin that’s also sensitive, acne-prone skin that’s severely dehydrated on the surface, skin that’s been compromised by over-exfoliation or a particularly harsh chemical peel.. There’s usually an answer for just about every skin complaint. 1. Cicaplast Skin Recovery Accelerator – September price £8.58. Accelerates the healing process (so perfect after a peel or other chemical exfoliation) whilst providing some antibacterial protection. Brilliant for severely chapped lips, I find, as an overnight treatment and on minor burns and scrapes. If my face is a little raw after a beauty shoot (makeup on and off all day) then this is one of my most trusted aftercare products. I apply it in a thin layer just as I would a moisturiser and it hasn’t ever given me spots or made my face greasy. Yet. Get it here. 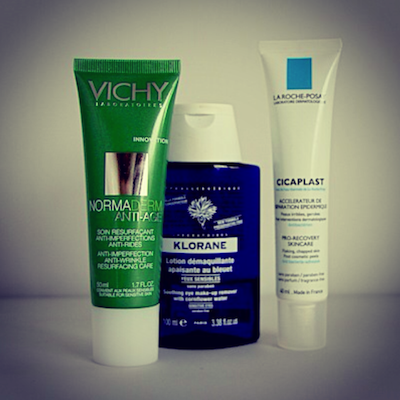 2) Vichy Normaderm – September price, £9.90. A glycolic-based light moisturiser that can be used day and night to resurface and plump the skin. Collagen production is stimulated, skin is smoother and on top of all of this, Normaderm is designed for blemish-prone skin. I really like this one. It doesn’t pack so much of a punch as Liquid Gold, I don’t think, but I rather like that you can use it morning and night and every day. Make sure you wear an SPF in the daytime. Get it here. 3) Klorane Eye Makeup Remover – September price £4. Simply one of the best gentle eye makeup removers that I have tried. For four quid. It’s a no-brainer. Get it here. 4) Avene TriAcneal Cream – September price £15.32. Another effective exfoliant and anti-blemish cream with a smoothing, clarifying effect. I find the texture to be a lot thicker than the Vichy, which means that I use a lot more, so it does work out to be more expensive. I’m not sure which has the greater Glycolic content or at what pHs they work at, but I find both to be equally effective. Get it here. 5) NUXE Honey Lip Balm – September price £6.27. Just bloody gorgeous, that’s all I can say. Non-sticky, non-glossy, has an almost matte finish and smells out of this world. The heavy glass pot and chic styling always makes me think that this should be a lot more expensive than it actually is, but with a third off it’s a steal! Get it here.